Adaptogens. They are one of the newest powerhouses of the skincare world and with each new release that made its way across my screen, my curiosity grew. Here are a few of my favorite finds. If you want calm, hydrated and protected skin, it looks like adaptogens are the way to go. They get their name by helping the skin adapt to what the body needs instead of pushing it in any certain direction. When you consider that everyone’s skin needs can be different, that was huge for me. While it should be noted that adaptogens have not been approved for use by the FDA because of lack of studies, the evidence is in the results for me and by the looks of the reviews on these products, many others too. I can’t start the list off properly without mentioning the product that first caught my interest. 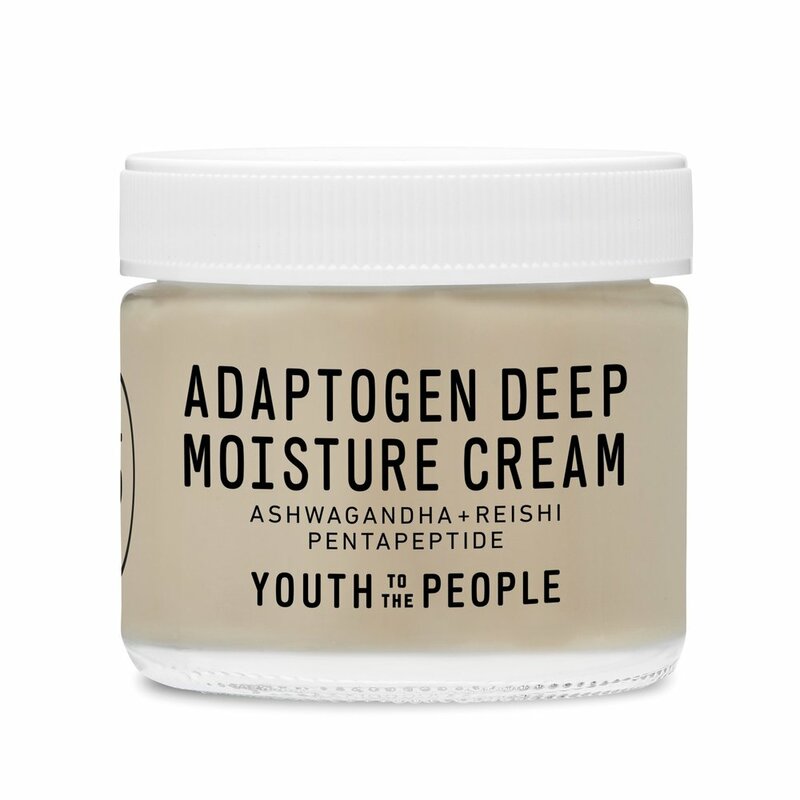 This cream features not one but four adaptogenic herbs and mushrooms (ashwagandha, rhodiola, reishi, and holy basil). Ashwagandha is packed with antioxidants, iron and amino acids to combat stress, anxiety and exhaustion. Reishi helps the skin maintain homeostasis, keeping the body stable in spite of any changes or stressors. Rhodiola works to help increase skins strength and resistance to stress. To top that off, they threw in Pentapeptide, a peptide complex that calms the stress reaction in sensitive and irritated skin. Just think, you’re a jar away from the most mellow skin of your life. Apart from your normal resurfacing ingredients like Glycolic, Lactic, and Salicylic Acid, this potion also includes the adaptogenic superstar Reishi and Tocotrienols to help boost hydration, combat the signs of stress in the skin caused by free radicals, and strengthen the skin's natural barrier. Pat it on with your fingers or a cotton pad or even mix it in with your moisturizer. Starting early with combating signs of aging is my approach, and this serum is the biggest weapon in my bag. It sinks deep into the skin to plump any fine lines or wrinkles without stripping the skin. In fact, it actually creates a long lasting moisture barrier for the skin, which helps prevent future wrinkles. Reishi is the adaptogenic hero in this formula as well. Based on this list, my skin must be loving it. It does, however, contain essential oils for fragrance, so watch out for that if you’re sensitive. Specially formulated for the colder months, this was right on time for my skin. Thicker and more occlusive than it’s warm season counterpart, it physically prevents water loss from the skin. It’s adaptogenic feature is the Schisandra chinensis fruit extract, and it works like most other adaptogens, to fight stress and calm skin. A refreshing tonic that doubles as an environmental barrier. The adaptogen in this tonic is the Siberian ginseng which protects against cell damage. Pair that with the antimicrobial, soothing properties of the gold, hydration and cooling from the rose, and a “hydrating complex” which is said to boost hydration levels by 300% and you’ve got yourself quite a concoction. Four Sigmatic is taking the leap into skincare with this new edible face serum. Rich in oils like Jojoba Seed, Avocado, and Tsubaki Seed Oil, this serum is made to be applied topically to the skin, but is also a dietary supplement when ingested. It also contains 18mg of Reishi Spore Oil, which is extracted from the cracked spored of Reishi mushrooms. Enriched with Vitamin E, this serum helps to keep your skin soft, smooth, and moisturized.